The FDA recently approved a new type of contact lens that can function like transition sunglasses. The new Acuvue Oasys Contact Lenses with Transitions Light Intelligent Technology, darkens with exposure to light, just like eyeglasses can. This would allow people to wear clear contact lenses that would provide sun shielding when they go outside. The advantages of this contact lens are clear. They would be especially useful for patients who play sports or are involved in active outdoor activities. The change in color based on location is unique, and is a big difference between these and tinted contact lenses. The last lens that provided anything similar was the Nike Maxsight contact lens. This lens was made with 2 tints for different sports, but they did not change color when people came indoors. The obvious disadvantage is, when someone is done with their outdoor activity, they would have to take the contacts out. Otherwise, it would be like having sunglasses on while you are indoors. These lenses were really great for their specific function, but did not gain popularity among patients due to the cost and inconvenience of not being able to wear them indoors. The new contact lens, made by Johnson and Johnson is in the same familly as the well-established, high quality Acuvue Oasys lens that is already worn by millions of people around the world. These lenses are very comfortable, high quality lenses that allow moisture and oxygen to get to the surface of the eye for better eye health. 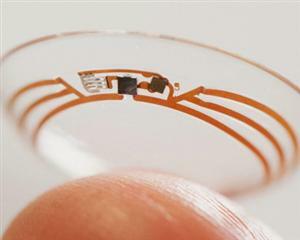 These lenses are designed to be worn for 2 weeks and are considered a disposable contact lens. There are a wide variety of contact lenses available to patients, but most doctors use disposable lenses. Increasingly, they are going away from long-term lenses and even using daily disposable lenses. These lenses last for one day, and so patients are not required to use any cleaning solutions. It is very rare these days for doctors to prescribe lenses that last longer than a month, let alone the older style that lasted a year. Overall eye health is becoming the biggest concern with contact lens styles, and this next step in UV protection as well as sunglass-type transition tinting are a logical next step for the increasingly active population. The only problem with using these lenses is that they do not provide any protection for the skin around the eyes. This type of protection is very important to prevent skin cancer, and sunglasses with ultraviolet protection are the best option for this issue.